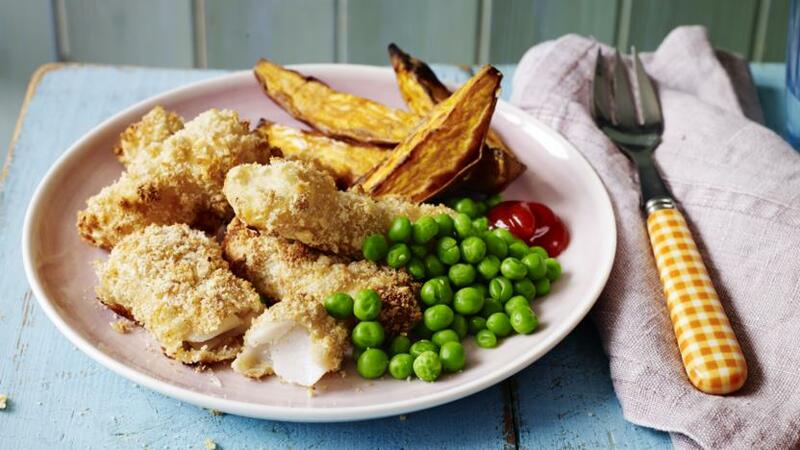 Fish fingers taste wonderful when you make them from scratch - even the kids can help! Guaranteed to impress. Preheat the oven to 200C/180C Fan/Gas 6. Line a baking tray with non-stick parchment paper. To make the breadcrumbs, put the bread in a food processor and blitz into fine breadcrumbs. If you do not have a food processor, you could also try grating the bread, but you would need an adult to help you with this. Pat the fish dry using kitchen paper. Carefully cut the fish into strips, the strips should be about 2cm thick and 8cm long. Run your finger gently over the fish to make sure all the bones have been taken out, you can get an adult to double-check this for you. Set up your assembly line. Get 3 dinner plates and one shallow bowl ready. Put the flour on the first plate. Crack the egg into the shallow bowl and beat lightly using a fork. Put the breadcrumbs on the second plate and mix with the paprika, garlic powder and black pepper. The third plate is for the coated fish fingers. Toss each fish finger in the flour and shake off any excess. Next, dip the fish fingers into the egg mixture and allow any extra egg liquid to drip back into the bowl. Then coat the fish fingers with the breadcrumbs. Slightly press the fish fingers into the breadcrumbs to make sure they are well coated and then put them on the third plate. Put the fish fingers in the fridge for 10 minutes, this will help the coating stick to the fish better. Wash your hands again before moving on to the next step, it is really important to always wash your hands after handling raw fish or meat. Arrange the fish fingers in a single layer on the prepared baking tray. Drizzle or spray some oil over the fish fingers. Bake in the oven for 10-12 minutes, turning halfway through using cooking tongs. The fish fingers are cooked when the crumbs are golden-brown and the fish is cooked through. These fish fingers are best served with ketchup for dipping and with sweet potato wedges and peas alongside. Always wash your hands before preparing food and cooking. Stale bread makes the best breadcrumbs and freezing the bread before processing it makes it easier to turn into breadcrumbs. You may not use all the coating, but having more will make your work easier. Crushed cornflakes or cream crackers also make a good coating. Place them in a plastic bag. Then smash up until fine, breaking up any big bits with your hands.